It’s silly to complain when others find value in your work, isn’t it? After all, isn’t that what we’re all about? I always enjoy learning how others have taken something I’ve written or created, shared online via Creative Commons NonCommercial-Sharealike-Attribution and then sold access to the content. It tells me they knew how to extract financial value out of something I made for fun. Ok, maybe that’s a little sarcastic…and no one is perfect, as I reveal in this blog entry. Still, when other educators take work I’ve done, remix or share it with others, that clues me into the value. Unfortunately, I almost have to “snoop” incoming links to find out if other people see something I’ve done as valuable–I usually do it when I’m procrastinating about something. One of the troubles I’ve had recently (last few years actually) is figuring out what’s valuable work and what isn’t. I’m not sure how I lost my perspective on this. 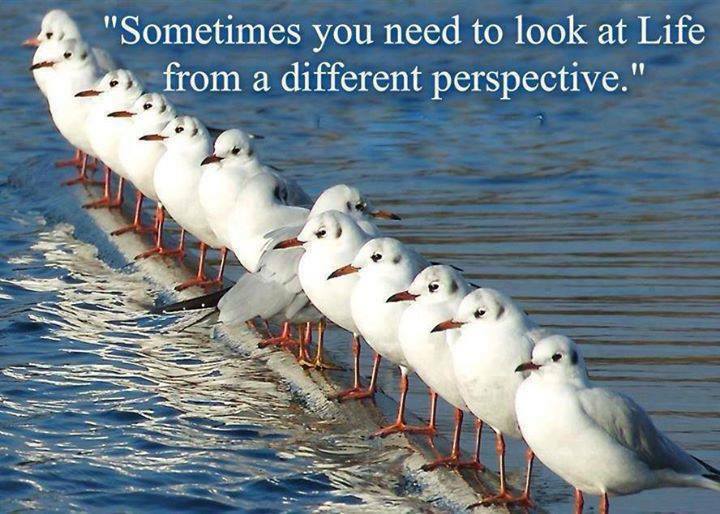 That’s why incoming links provide some insights into what others see as valuable. There is so much rich, valuable content available online, the main differentiator (sp?) isn’t content but style and the angle with which you approach a topic. We’re all at the nexus of a variety of fantastic stuff–which as Vicki “CoolCat Teacher” Davis found out recently–puts each of us at risk for using, or “stealing” the same stuff, even unintentionally. It’s all a big remix playground. The value is in how you package it, and remix it to be useful for those you serve. So, while I do welcome others using materials, I wish they would share them the way I shared them originally or as close to that as possible. “Our assistant superintendent,” shared a job-hunting colleague with me during a Winter Break vacation, “told us that we couldn’t share what we’re doing with other districts because of copyright.” I clarified the statement, “You mean, an assistant superintendent limits sharing of the great things happening in your District because s/he is afraid of copyright issues?” What a bunch of baloney, right? At Dangerously Irrelevant, we see a great set of questions like those in bold/italic at the top of this post. They remind me of why people DO NOT blog or contribute. Often, the work they do isn’t considered being “good enough” to be shared. They look at their work and they say to themselves, “I’m inadequate to the task of sharing content with others, my work belongs to my employer and I don’t feel all that comfortable sharing it.” Yes, I’ve heard that. The first time I encountered that story was when I visited New Zealand and listened to a teacher explain why s/he hadn’t created a blog. But when she did, the response overwhelmed her, restored her faith in what she was learning and could contribute to the world. Actually, the first time I heard it is when I told myself in college, What can I write that hasn’t been written before even better? For me, it was an act of defiance to write, to thumb my nose at Alexander Pope who never wrote a couplet I didn’t love, and say to him, along with Shakespeare, Joyce, Darn-it, I will write, not because I will be better than you but because I’m alive and you’re dead! It worked. At least for articles and blogs. I don’t know if I will ever build up the enthusiasm for a book. Does my creativity jar have a crack in it? Is it leaking valuable fluid? Absolutely. Maybe, I should just shut up because there are people smarter than me posting blogs, doing podcasts, etc. Great teachers don’t teacher you to be creative because no one is creative standing alone. All build on the shoulders of giants. It’s getting harder to learn everything the giants have given us. Things all learned over time, while being productive and dependable. The idea that it’s getting harder to learn everything the giants have given us…that concept means that the rest of us, maybe, should just shut up and learn what’s been given, created in the past, and pass that on to our children. But the truth is, as human beings, we ooze creativity, wallow in it like pigs in the muck because creativity empowers our every act, even when it leads us down the path to destruction. Ask yourself, can we stop the geneticists who are engaging in god-like engineering? Can we stop those creating more efficient ways to kill others? Can we stop a writer from authoring, an artist from sketching, a singer from allowing the wind to raise her voice? The power of the Read/Write Web facilitates human beings doing what is essentially who we are–creating, connecting, collaborating, not in that order. Those triggers to creativity reside in the power of the connections made. As a leader, there has to be an expectation of creation from the people whom you work with. What’s more, you have to defy (if necessary) the culture of control that people perceive is holding them back, that restrains their curiosity, mangles their motivation. 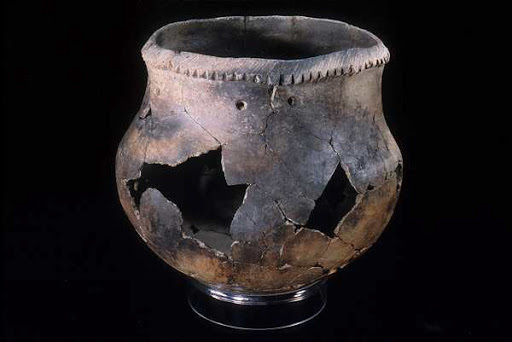 Whether that culture exists or not, the perception is what damages. Are you giving or just taking? I suppose most of us take what others give, curate it, share it, push it around on the plate but seldom add anything to it. A leader’s job is to create conditions that promote authorship. As a writer, being an author empowers me to create and share with others. If you feel safe, supported enough to be create, innovative as a team member, then I would consider this a success. With such a team of empowered creators, acts of collaborative authorship can transcend and transform organizations. Do we create the conditions that promote authorship and then make that available for others? As for me and my creative children (these blog entries), we share it all under creative commons copyright (sharealike-noncommercial-attribution). Who Owns the Data in GoogleApps for Education? Hi everyone. I’m helping a couple of local schools to set up apps for education accounts. I’ve been asked by one of my bosses to find out who owns the data that we write in google docs, emails etc. Is it Google or is the owner of the account? Two possible ways to interpret your question. Allow me–not a lawyer–to attempt a response at both. Noncommercial should also be entertained. If my responses are inaccurate, please feel free to correct me! 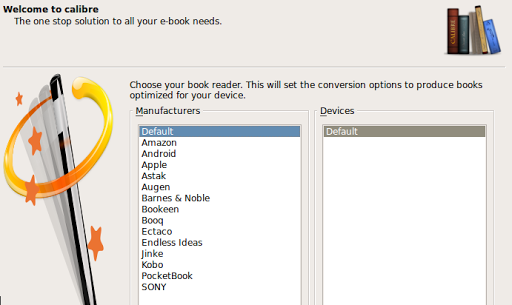 Note: The info here is relevant to Kindle and iPad owners as well as Nook users. “No,” I replied with a smile. 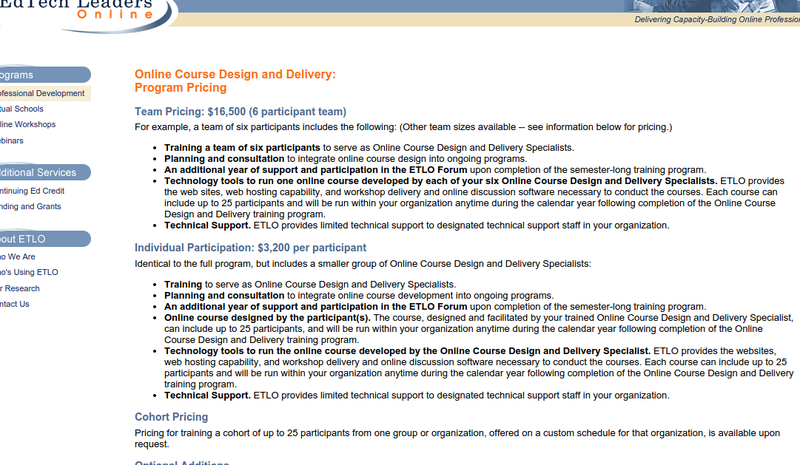 “It’s less expensive…and I have access to other technology for that. This is for pleasure reading.” My smile grew as I remembered the 100+ books I’d downloaded in ePub format last night. (of course, you can swish your finger across the touch screen on a Nook to get to the previous or next page but I forgot that in the discussion). When I got home with my new Nook, my wife questioned my sanity…an “inexpensive” book reader you can’t even surf the web with? Hmm…I tried to minimize her concerns, pointing out that I’d already downloaded enough ePub books from Baen to not buy any new print books for quite awhile! 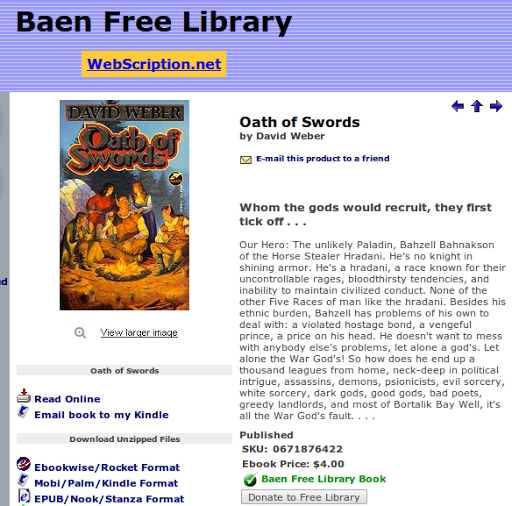 Surprisingly, I hadn’t ever read any of the books available from Baen’s Free Library, not to mention the rich variety of free sci-fi ebooks available on other sites. My daughter greeted the addition of the Nook as an enemy of print books, signaling the demise of beloved friends, betrayed by her own father. She refused to look at it. Those expressions of dismay and disappointment aside, I found myself looking at the Nook and wondering, maybe I made the wrong choice. But then, I turned it on, registered it with my account info, and the two books I’d purchased appeared. I connected to the WiFi connection. So far, so good. But then, what really knocked my socks off was Calibre. It’s pretty amazing in that you get a preview of the cover of the book…I was thrilled to find Andre Norton’s books available for free, finding the entire collection of stories (Time Traders, Defiant Agents) that I’d read long ago and were now out of print. Aside from free ePubs available, I have to confess my profound appreciation for the Baen authors and publisher, who share their books in a variety of formats. You have to admire the Baen Free Library of Books. Note that they offer books in a variety of formats, including Mobi (which is Kindle friendly) and ePub (which is Nook and iPad friendly). Baen Books is now making available — for free — a number of its titles in electronic format. We’re calling it the Baen Free Library. Anyone who wishes can read these titles online — no conditions, no strings attached. (Later we may ask for an extremely simple, name & email only, registration. ) Or, if you prefer, you can download the books in one of several formats. Again, with no conditions or strings attached…. I, ah, disagreed. Rather vociferously and belligerently, in fact. And I can be a vociferous and belligerent fellow. My own opinion, summarized briefly, is as follows…. Online piracy — while it is definitely illegal and immoral — is, as a practical problem, nothing more than (at most) a nuisance. 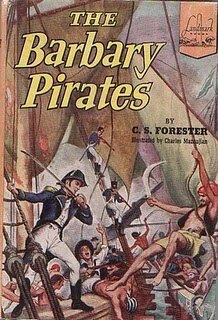 We’re talking brats stealing chewing gum, here, not the Barbary Pirates. I disagree…consider these links below with the amount of books available for “free” from pirates…I do not consider this that simple. Entire collections of books are available online for download via torrent…if I were a book publisher, I’d be worried! Yet, one seldom hears of this…in fact, the knowledge of these is kept secret. These links below to torrent files represent a fortune in books…does their availability signal the dawn of a new age of writing? 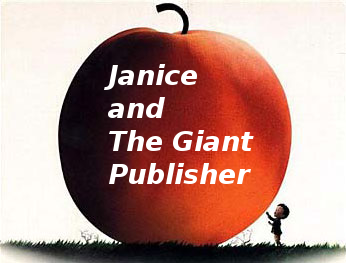 Authors write for fame, not fortune? Stephen King books – everything he has ever written. How does King feel about all his work just being out there for free download? This is just a sample of the over 20 pages of “torrents” available with ebooks that are copyrighted…even the King James Bible appears. The search took all of 10 minutes, if that, using Google Search Engine. This activity took less than 2 minutes. I’m starting to wonder if Flint knows what he’s talking about (I’m still grateful for the Baen Free Library!!! 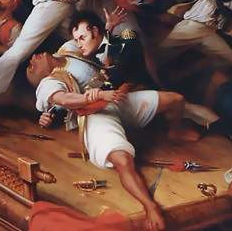 )…this can’t be a mosquito bite, unless you count getting eaten by mosquitoes no big deal (watch this video of a man in Panama, my country of origin, suffer being eaten alive—might shock you). I don’t know any author, other than a few who are — to speak bluntly — cretins, who hears about people lending his or her books to their friends, or checking them out of a library, with anything other than pleasure. Because they understand full well that, in the long run, what maintains and (especially) expands a writer’s audience base is that mysterious magic we call: word of mouth. Word of mouth, unlike paid advertising, comes free to the author — and it’s ten times more effective than any kind of paid advertising, because it’s the one form of promotion which people usually trust. As I look at my new Nook, bursting with more Baen books I couldn’t hope to read in a year (I have all this other “academic” reading to do), I realize I probably am not the run of the mill ebook reader. I’m not one of those folks that runs out and buys the latest book and reads it because I want to talk about it around the water cooler. I read for pleasure and that’s what my Nook is for. I’ll worry about what happens when I run out of Baen free books when the time comes. For now, off to read! Remembering work I’m doing is “for school” but not paid, so doesn’t belong to school. Need to set up on personal page/site, not school. Work done FOR SCHOOL, even when done on own time, falls under work for hire. Check it! Ken Task asked these questions recently…I thought I’d share them with you because they’re great questions. He was sharing this scenario, possibly in response to this article on TeachersPayTeachers, a site I briefly reviewed here and mentioned at the request of the author, Paul Edelman. As I said before, Locking things up isn’t the way to go…it’s an old model. I’m glad to see Dean Shareski has also noticed this, too. Let’s say a teacher develops a GREAT lesson plan, activity, unit, etc.. at your ISD. Then decides to use the site that allows them to sell it via an EBay like system. 1. Did the teacher use any ISD resources while developing their product? 2. Are there any “legal claims” an ISD can make upon the items being sold by the individual teacher that would prevent a teacher from doing so? 3. Does your ISD already have a “policy” to cover this example? 4. Has that policy been “tested” in court? Of course, consider that teachers employed by districts may face work for hire copyright infringement. 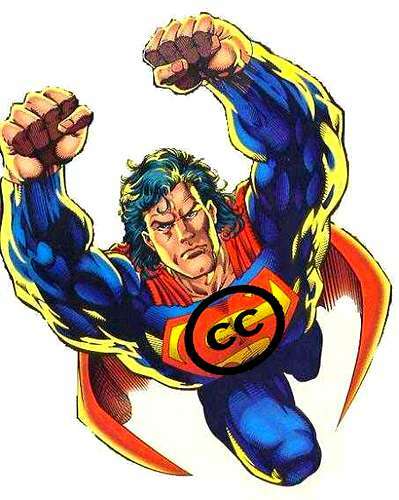 According to Carol Mann Simpson, copyright guru…. Just about anything that a teacher does within the context of his or her job could be claimed as the intellectual property of the school. A common question is to inquire if doing the work at home or on weekends or vacation makes any difference in the work for hire rules. Actually, no, it makes no difference. If the work was done “within the scope of employment” it matters little where or when the work was done. So, the question is, what will districts choose to do, if they should find out? Will enterprising teachers be “outed” by their colleagues? Will THIS tale end happily? Only you, fellow edubloggers, can decide that. Please post this on your blog. This post originally posted at Tim Holt’s blog, Unintended Consequences. I steal it with impunity and his permission (grin). What a good sport he was when Janice Schlottmann and I appealed to his techie expertise as Tim waited for a Skype call from a Superintendent that never seemed to arrive. The following is Tim Holt’s post…. What happens when a teacher comes up against a textbook company and it’s intellectual property protection clause? In this case, the teacher is left with little help from their education “partner” and is left to fend for herself. A three-way conversation between first grade teacher Janice Sloatman, Miguel Guhlin, and Tim Holt on an interesting dilemma. Listen and think about what would you do? We have a faculty member that has several older VHS tapes of stuff she has bought in ht epast, not recorded off the TV etc. and want to put them on DVD. She clams that they are either no longer available or not available on DVD. What is the legality of doing such. Violate copyrights yes or no? Well folks after lots of research, advice and expert opinions (including Dr. Carol Simpson) here is the answer, kind of. If the VHS video is available on DVD then it is probably a violation, If the VHS video is NOT available on DVD AND the equipment is cannot be purchased on the commercial marketplace then under DMCA the transfer can be made to another format. VHS players are available at Walmart and other places and pretty cheap. “If the video is not available in the format you wish, and the copy you have is deteriorating, the library can make an archival backup in the format you wish, but the copy may not leave the library. Just because something is out of print does not give automatic permission to copy. In fact, the purchase was probably under “life of tape” rights, which means you get that one shot at it. If it broke, too bad — buy another. If you take good care of it and it lasts 20 years, you can use it for 20 years as long as you have the technology to play it. But since video is usually very topical, a producer may not wish to have the program live beyond its usefulness and accuracy. 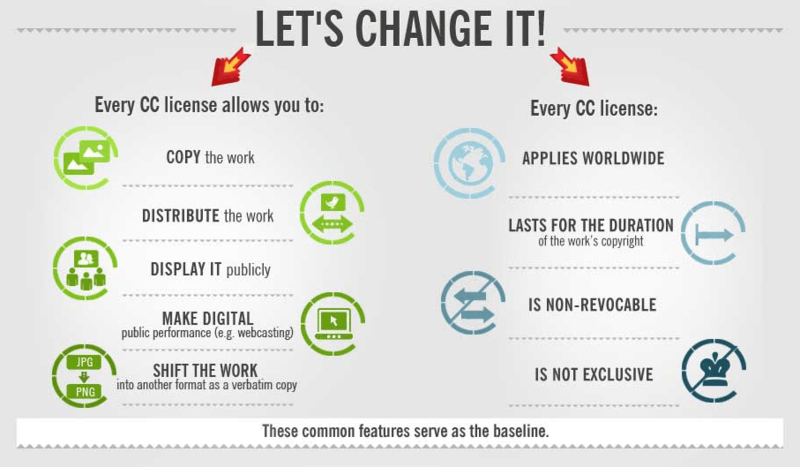 It is the producer’s (or copyright owner’s) right to take the program off the market and let it die as the copies die. Basically to copy the tape is a violation of the copyright. Libraries can make copies but they cannot leave the library. Archival copies might be able to be made. So in my opinion, for what it is worth, if you want to open the district and possibly yourself to civil liabilities good ahead make the copy. I have decided I will have no part of it. I was looking through your webpage and found your handout for podcasting. I’ve just ordered a slew of Olympus 210’s and will be teaching Audacity in January. Can I use your handouts? Please! What the “bleep” is the ShareAlike-NonCommercial-Attribution license? As I laughed, it hit me that, sheesh, how many more conversations like this will I need to have about CC with educators? The number I came up with was depressing but also fun–ignorance is opportunity. make money off of it. Attribution=You have to give me credit for the work. Don’t worry about ShareAlike – I’m too lazy to change anything. Don’t worry about NonCommercial – Come on, Miguel, it ain’t THAT good! 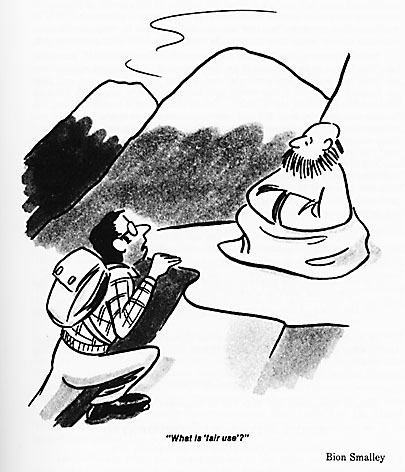 Don’t worry about Attribution – If there are any mistakes in it, I want you taking the blame. This situation came up…do you know the answer? I am trying to burn a DVD short clip movie. How can you help me do it? I need this for a presentation. …movie clips can be used for workshops/presentations described below. Principle One states you can use a movie clip under fair use, however, is it against the law to circumvent copyright protections to get the clip? If I want a clip from a popular movie to use for a workshop, and I circumvent copyright to get it (maybe using Handbrake), have I broken the law as this comment below suggests? So, of what value is Principle One so long as DMCA is in effect? Is the person with the DVD blocked from circumventing copy protection to make a clip? What about a clip that is on YouTube?